(a) Inspect the SET function. (1) Turn the cruise control main switch on. (2) Drive at the required speed of between 40 km/h (25 mph) and 200 km/h (125 mph). 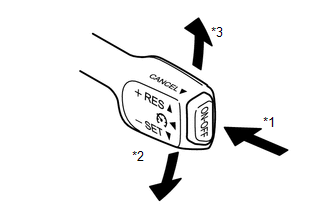 (3) Push the cruise control main switch to - SET. (4) Check that the SET indicator light illuminates at this time. (5) After releasing the switch, check that the vehicle cruises at the set speed. (b) Inspect the + function. (4) Check that vehicle speed increases while the cruise control main switch is pushed to + RES, and that the vehicle cruises at the newly set speed when the switch is released. 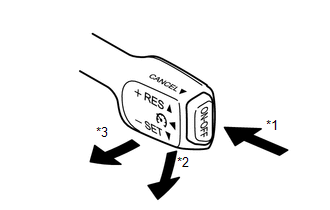 (5) Push the cruise control main switch to + RES and then release it immediately. Check that vehicle speed increases by approximately 1.6 km/h (1.0 mph) (tap-up control). (c) Inspect the - function. (4) Check that vehicle speed decreases while the cruise control main switch is pushed to - SET, and the vehicle cruises at the newly set speed when the switch is released. 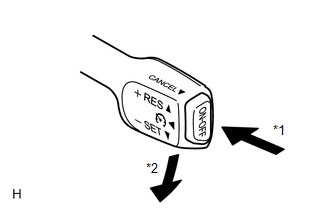 (5) Push the cruise control main switch to - SET, and then release it immediately. Check that vehicle speed decreases by approximately 1.6 km/h (1.0 mph) (tap-down control). (d) Inspect the CANCEL function. (4) When performing any one of the following, check that the cruise control system is canceled and that the normal driving mode returns. (e) Inspect the RES function. (4) Cancel cruise control operation by performing any of the above operations (other than turning the main switch off). 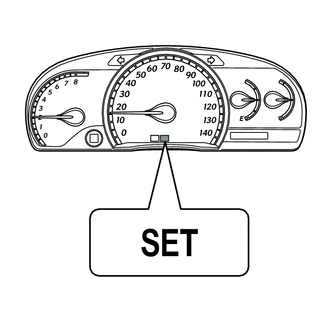 (5) After pushing the cruise control main switch to + RES at a speed of more than 40 km/h (25 mph), check that the vehicle resumes the speed set prior to the cancellation.